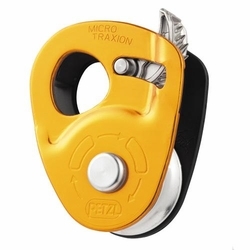 Petzl MICRO TRAXION Pulley. The MICRO TRAXION is an ultra-light (85 g), ultra-compact progress-capture pulley that is exceptionally efficient (91 %) thanks to its sealed ball bearings. The cam works on dirty or icy ropes and can be locked in open position for use as a pulley.